HÀ NỘI — Newly-released test results prove that polluted water caused mass fish deaths in the middle of June at farms in south central Bình Thuận Province. The deaths occurred around Kê Gà Lighthouse in Tân Thành Commune of Hàm Thuận Nam District. The results released by the province’s Standards, Metrology and Quality Division showed that the water that was used to raise fish contained excessive arsenic – 0.5 times higher than the national standard – and too many organic substances as the chemical oxygen demand (COD) was 2.5 times higher than the standard. 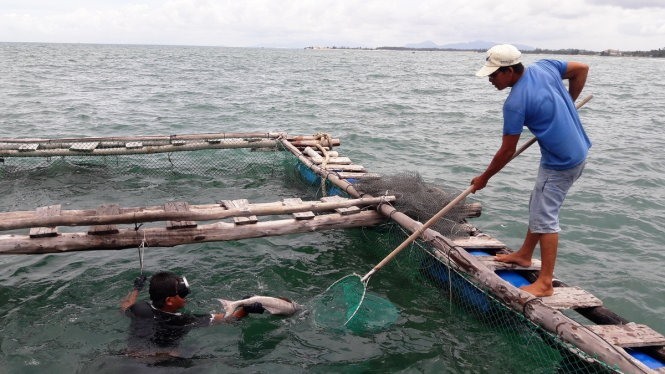 The wastewater from a fish-steaming establishment near the farms was also tested as the establishment was found to be illegally discharging its waste water into the sea soon after the mass fish deaths. The wastewater’s nitrogen concentration was 15.17 times higher than the standard, phosphorus level was 7.2 times higher than the standard and COD was 40.62 times higher than the standard, the test results revealed.